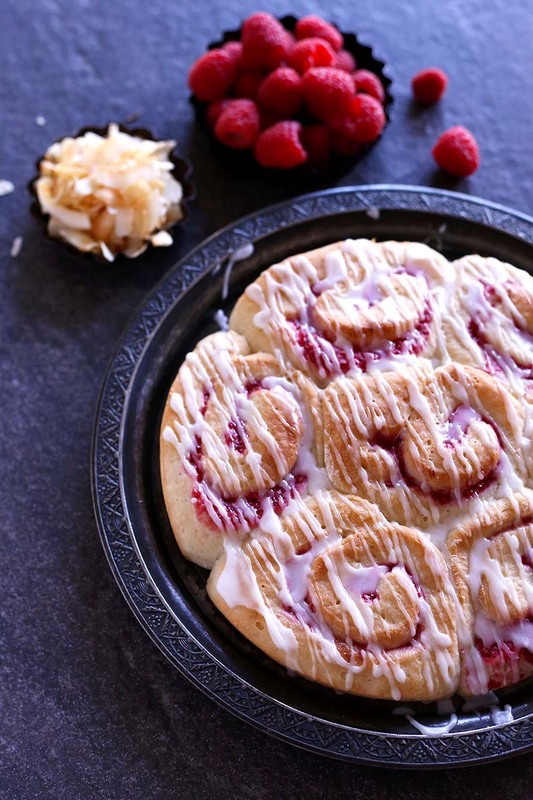 Soft and fluffy sweet rolls with a jammy raspberry filling and coconut glaze. Combine 1½ cups (210 g) flour, yeast, sugar, and salt in a large mixer bowl; mix on low speed until incorporated. Heat coconut milk in a microwave-safe measuring cup for 45 seconds to 1 minute, until very warm (120-130°F). Add warm coconut milk and coconut oil to flour mixture and mix until combined; mix in remaining flour. Switch out the flat beater for a dough hook, and knead dough for 5 minutes until smooth. Place dough in a large bowl coated with nonstick spray and cover with plastic. Let the dough rise in a warm place until doubled in size, about 40 minutes. Meanwhile, prepare the filling. Combine raspberries and sugar in a saucepan over medium-high heat, stirring constantly. When mixture begins to bubble, reduce heat to low and simmer for 15 minutes, stirring occasionally. Whisk water and cornstarch together in a small bowl. Add to raspberry mixture and continue cooking until thickened, 1 or 2 minutes. Remove from heat and stir in Chambord; set aside. To check if dough has doubled, lightly flour two fingers and press them down into center of dough. If indentations remain, gently press down dough; cover and let rest 5 minutes. Spray a 13 x 9-inch baking dish (or two 9-inch round pans) with nonstick spray. Turn dough out on a lightly floured board and roll into a 16 x 12-inch rectangle. Use a pastry brush to brush dough with raspberry filling, leaving a ½-inch border. Carefully roll dough up into a tight log and pinch edges to seal. Trim off uneven ends and score dough into 18 equal slices. Use unflavored dental floss to slice dough crosswise (slip a long slice of floss under log of dough and cross on top to cut slices cleanly). Place rolls cut side up into prepared baking dish. Cover loosely with plastic and let rise in a warm place until doubled in size, about 30 minutes. While the rolls rise, preheat oven to 350°F. Bake rolls for about 17 minutes, until lightly golden. Remove from oven to cool on a wire rack for 5 minutes. To prepare glaze, whisk together powdered sugar, coconut milk, and coconut extract in a small bowl. Pour glaze over warm rolls; glaze will set as rolls cool. These sweet roll recipes are awesome!! Love getting sweet roll recipes, these are awesome!! Thanks.